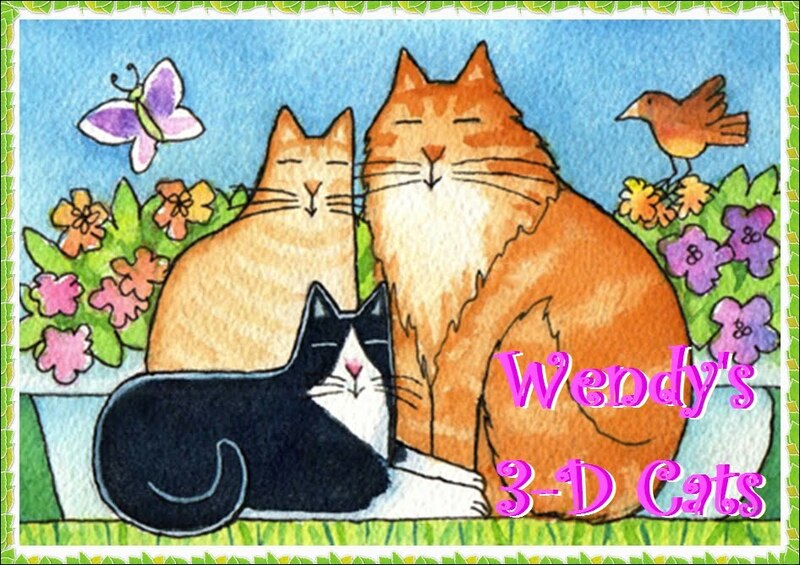 Wendy's 3-D Cats: HAPPY 7th BIRTHDAY, DYLAN!!! Today, Dylan turns seven years old. He's still the baby of the 3-Ds, though. Dylan really likes to celebrate himself, so I was able to capture this picture of him partying in the back yard. He and Spongebob are moseying over to Samson's place this afternoon. It's Samson's birthday, too! Go see him and join the party at "The Monkeys" in Montreal. HAPPY BIRTHDAY TO MY SPECIAL BOY! Happy Birthday Dylan! You are a very handsome boy! Let's party! We LOVE your birthday outfit, Dylan! 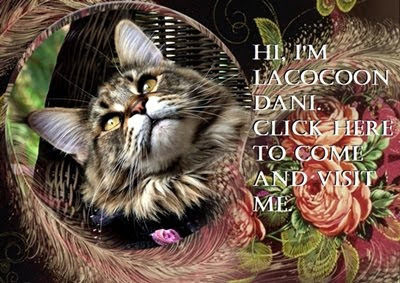 Have a fabulous birthday and we can't wait until you, Dante and Domino visit! Happy Happy Birthday Dylan!!!! You are just a youngster. Happy Birthday gorgeous Dylan!!! I love your party hat :-) Hope you have a fun-filled day!!! Hi Dylan! We being sure to tell everyone whose gots birthdays today hello and to has a happy! Our Pungy is having her number four year birthday today too! We love Spongebob! We sure like your party hat! You look like you has-in funs so we'll just say...party on, Dude! Happy Birthday dear sweet Dylan! We hope yoor day is really special. Let's party! LOL at the "very special." Happy birthday, Dylan! We think you're wonderful and we hope you have a fabulous celebration! Happy Birthday Dylan! Party time! Happy Birthday Dylan!! Looks like you know how to party! Happy Birthday Dylan! Have a great day. It's our dad's birthday today too. Happy, Happy, Birthday Dylan - we hope you have a great day with treats and kisses. Happy birthday to you, Dylan!!! Happy Birthday, Dylan!!!!!!! We just had a grand time at Samson's party, and know we will have a grand time with you also. Woo!! Hoo!! You sure know how to party Dylan!! Happy 7th Birthday and many, many, many moooooore!!! Happy, Happy, Happy Birthday to you Dylan!!! 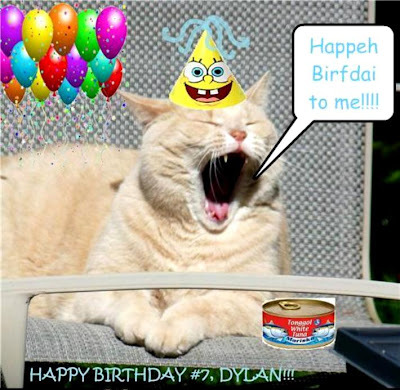 A very happy purrday Dylan! Happy birthday Dylan, you party animal!!! Happy Birthday, Dylan! We love your party pic. Happy PurrfDay, Dylan! Seven is the new four, you know! Have a wonderful day!!! Happy Birthday to you Dylan! You don't look a day over four! They say the number 7 has magical powers so this is going to be one magical year!